I now have several of my paintings available as limited edition prints. These can be ordered directly through the website, by post or by telephone. 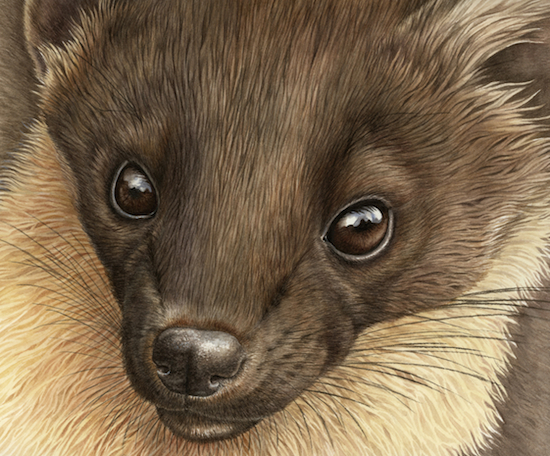 I have just added 'Pine Marten Pizzazz', another in my series of 'The Eyes Have It! ', depicting close-ups of some of the Highland's most fascinating mammals. 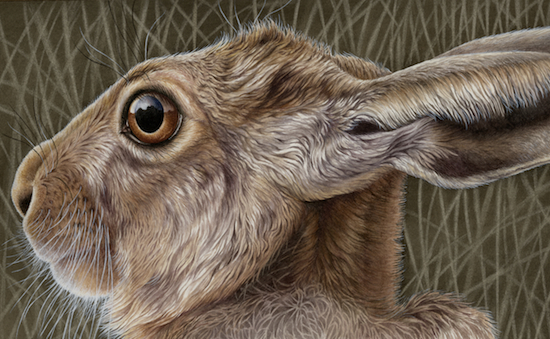 All my limited edition prints are high definition, digital reproductions of my original paintings. They are printed on acid-free, 100% cotton, Hahnemuhle Fine Art Photo Rag paper, using light-fast, pigment based Canon inks. They are sold mounted (unframed), using Arqadia Conservation board. Using these materials means that the prints will remain in mint condition for many years, with no fading or discolouration. It is advisable however, to display your prints out of direct sunlight, as this will eventually damage the ink and paper. I only produce very limited editions of my work, usually a print run of fifty. Each print is signed and numbered by the artist and comes with a Certificate of Authenticity (also signed and numbered). 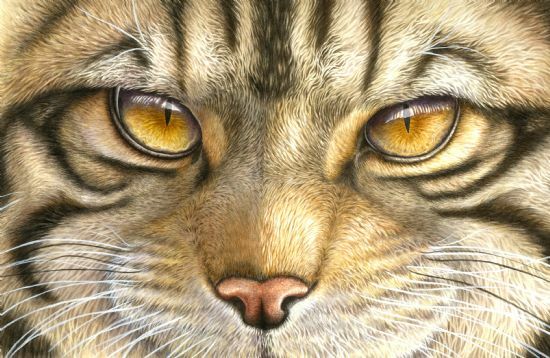 To order your print online via PayPal, just click on the Add to Cart button below your chosen image and you will be taken directly to PayPal's secure payment site. You do not have to have a PayPal account to use this service, you can also pay by credit or debit card. 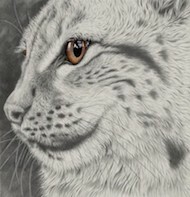 Alternatively contact me, stating which print you wish to order and I can arrange payment by cheque. All prices include Special Delivery postage and packing within the UK, or Airmail postage and packing to the rest of Europe. Please contact me for postage costs for multiple items and for postage costs to non-European destinations. Thank you. All the images below are available as hand made (by the artist) embossed aperture greetings cards (104mm x 152mm). Three different designs for £5.00 plus £1.20 p&p. 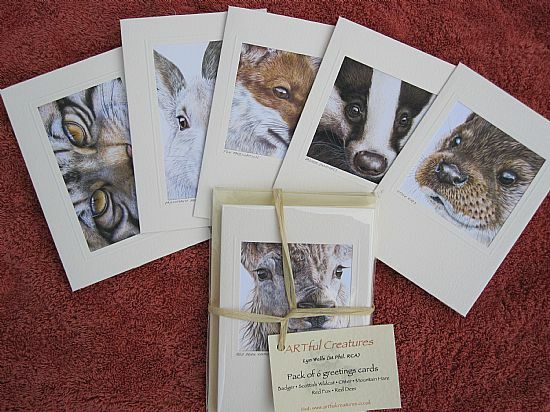 Also pack of six different mammal designs (Otter Eyes, Fox Fascination, Mountain Hare Moment, Badger Boldness, Red Deer Resplendent and Wildcat Watchfulness) for £9.00 plus £1.50 p&p (to order see below). 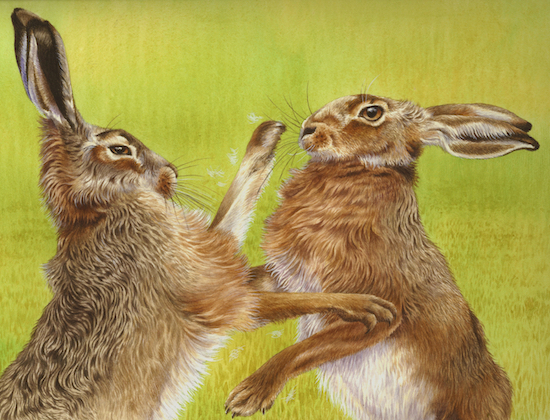 Reproduction of an original watercolour depicting Brown Hares 'boxing'. These beautiful animals are not very common in the Highlands and are always a thrill to see. Dimensions (including mount) - 367mm x 311mm (approx). Limited edition of 100. The painting is still available as an original. Please contact the artist for more details. 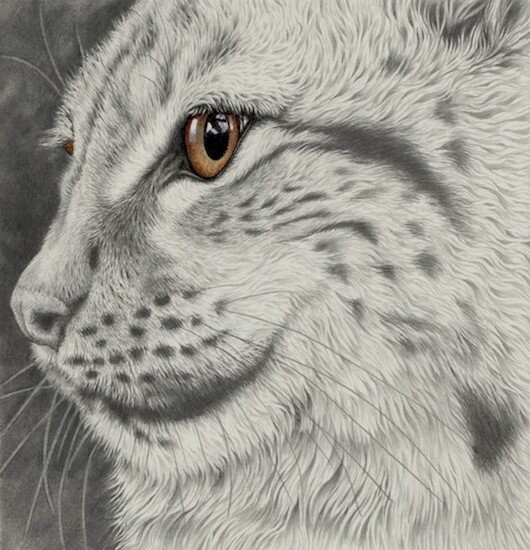 Reproduction of an original pencil/watercolour depicting the face of a Eurasian Lynx - Lynx lynx. This beautiful cat is considered vulnerable in central Europe. It became extinct in the UK in around the year 700. Dimensions (including mount) - 306mm x 314mm (approx). Limited edition of 100. The painting is still available as an original. Please contact the artist for more details. 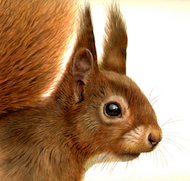 Reproduced from an original watercolour depicting this beautiful and elusive native of the Scottish Highlands. Dimensions (including mount) - 320 x 312mm (approx). Limited edition of 100. Reproduction of an original watercolour depicting the face of a Eurasian Wolf - Canis lupus lupus. Both vilified and glorified, this beautiful creature has survived despite human persecution. Dimensions (including mount) - 365mm x 296mm (approx). Limited edition of 100. The painting is still available as an original. Please contact the artist for more details. 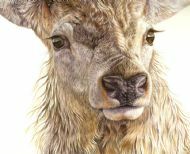 Reproduction of a watercolour depicting the face of a Red Deer Stag. These iconic mammals are often seen roams the hills of the Highlands. Dimensions (including mount) - 345mm x 310mm (approx). Limited edition of 50. This painting is still available as an original. Please contact the artist for more details. 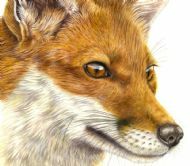 Reproduction of a watercolour depicting the face of a Red Fox. 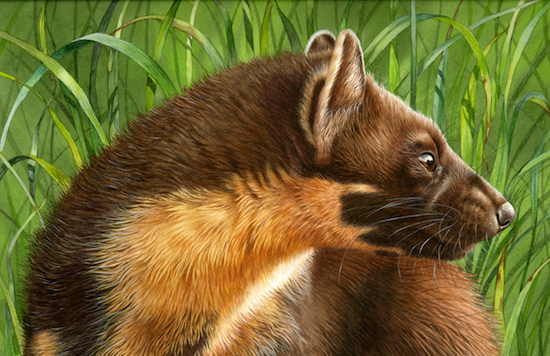 These beautiful animals are common with in the Highlands but are considered vermin by many. Dimensions (including mount) - 335mm x 315mm (approx). Limited edition of 50. 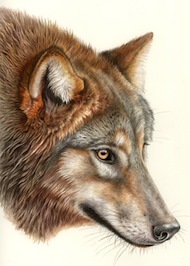 Reproduced from an original watercolour depicting this beautiful and elusive native of the Scottish Highlands. Dimensions (including mount) - 355mm x 280mm (approx). Limited edition of 50. 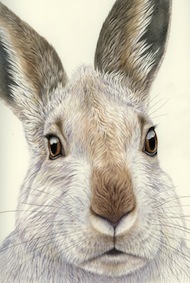 Reproduction of an original watercolour depicting the face of a Brown Hare. These beautiful animals are not very common in the Highlands and are always a thrill to see. Dimensions (including mount) - 272mm x 352mm (approx). Limited edition of 50. Reproduced from an original watercolour depicting this beautiful and elusive native of the Scottish Highlands in winter pelage. Dimensions (including mount) - 375mm x 290mm (approx). Limited edition of 50. 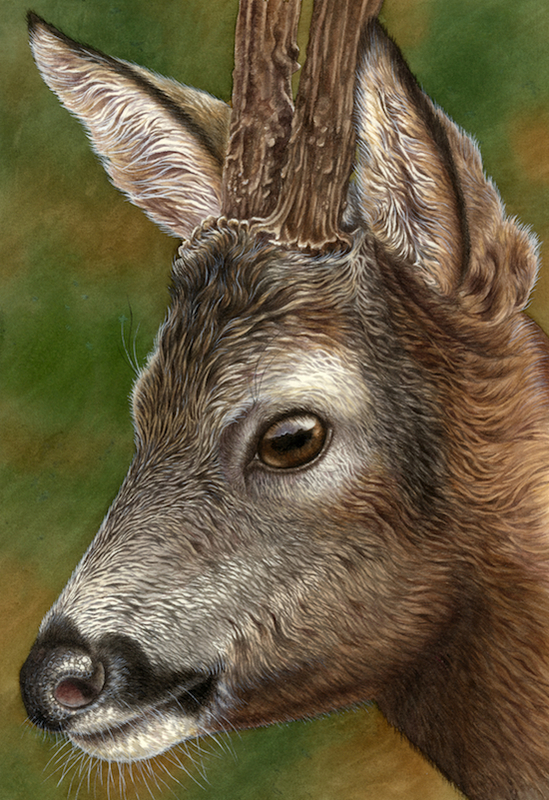 Reproduction of an original watercolour depicting the head of a Roe Deer. These beautiful animals are common within the Highlands but are always a thrill to see. Dimensions (including mount) - 380mm x 301mm (approx). Limited edition of 50. This painting is still available as an original. Please contact the artist for more details. 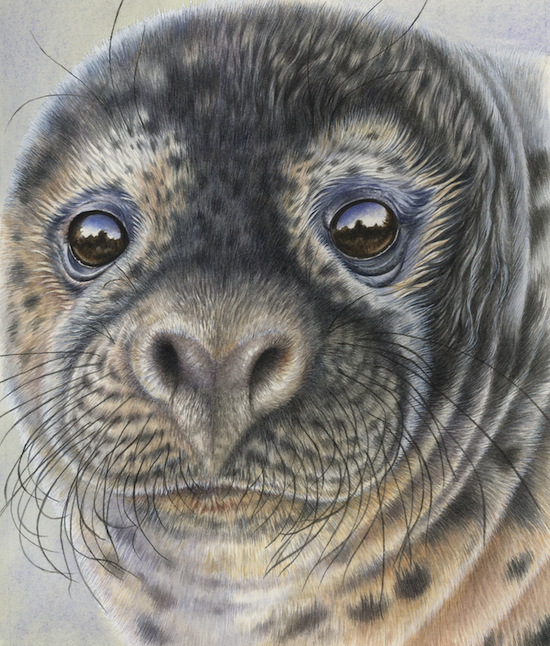 Reproduction of an original watercolour depicting the face of a young Grey Seal. These beautiful animals can be seen lounging on sandbanks around the Dornoch Firth in quite large numbers. Dimensions (including mount) - 323mm x 294mm (approx). Limited edition of 50. 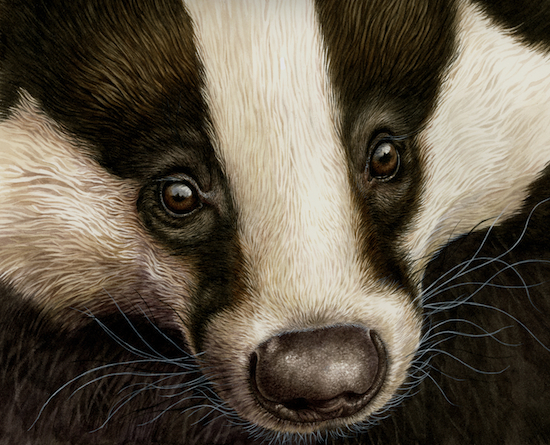 Reproduction of a watercolour depicting the face of a Badger. These beautiful animals are fairly thinly distributed in the Highlands and are always a thrill to see. Dimensions (including mount) - 355mm x 310mm (approx). Limited edition of 50. Reproduced from an original watercolour depicting this beautiful and elusive native of the Scottish Highlands. Dimensions (including mount) - 390mm x 300mm (approx). Limited edition of 50. 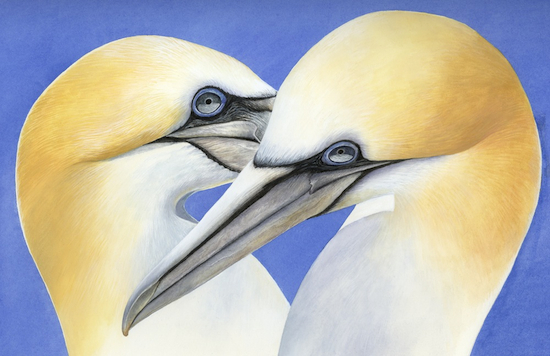 A recent painting of these beautiful birds. They are truly stunning. Limited edition of 50. Dimensions (including mount) - 400mm x 300mm (approx). Limited edition of 50. This painting is still available as an original. Please contact the artist for more details. 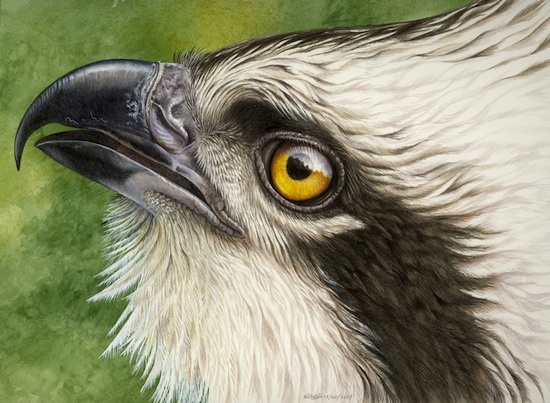 Reproduction of an original watercolour depicting the head of an Osprey. These beautiful birds are now doing well within the Highlands and are always a thrill to see. Dimensions (including mount) - 363mm x 300mm (approx). Limited edition of 50. 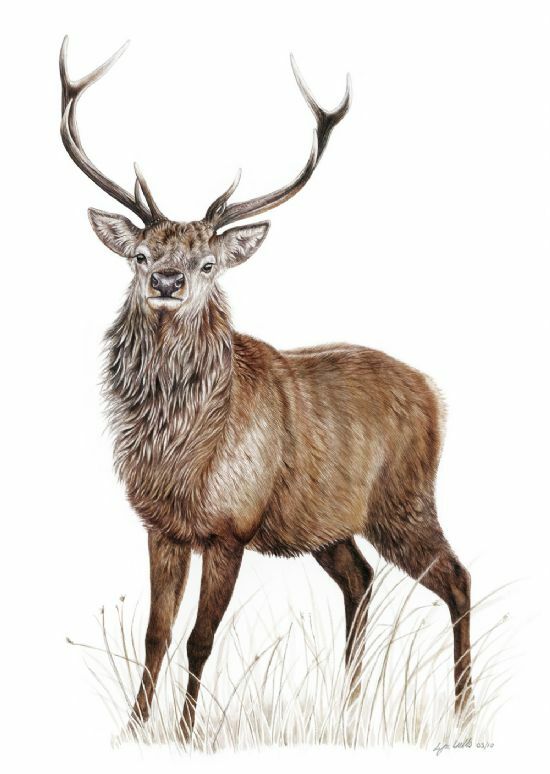 Reproduced from an original watercolour depicting this beautiful and elusive native of the Scottish Highlands. Dimensions (including mount) - 345mm x 305mm (approx). Limited edition of 50. 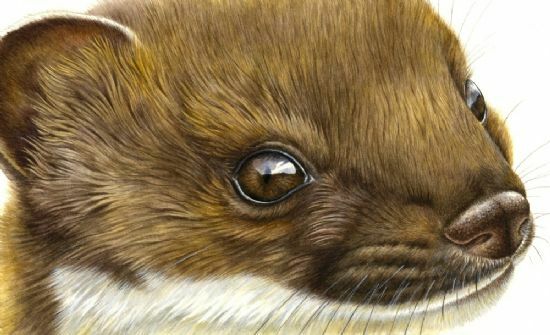 Reproduction of an original watercolour depicting the face of a Stoat. These amazing wee animals are ferocious predators and can kill animals that are several times their own body weight. Dimensions (including mount) - 355mm x 265mm (approx). Limited edition of 50. 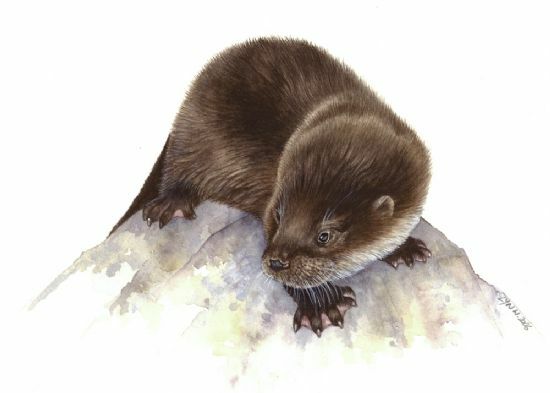 Reproduction of a watercolour depicting a wee otter cub. Otters are fairly common around the Dornoch Firth, but elusive and difficult to spot. Dimensions (including mount) - 277mm x 245mm (approx). Limited edition of 50. 15% of every sale goes to the International Otter Survival Fund (IOSF). 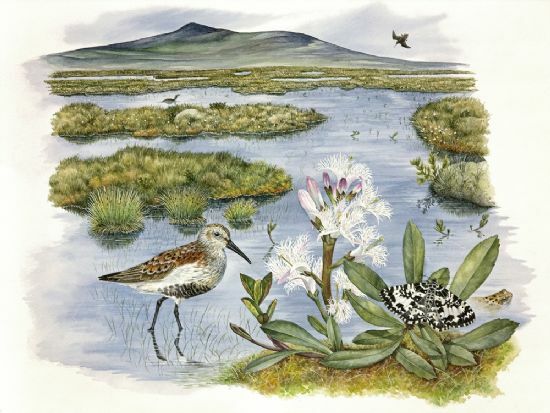 Reproduction of an original watercolour, depicting Sutherland's beautiful flow country. Dimensions (including mount) - 530mm x 405mm (approx). Limited edition of 50. 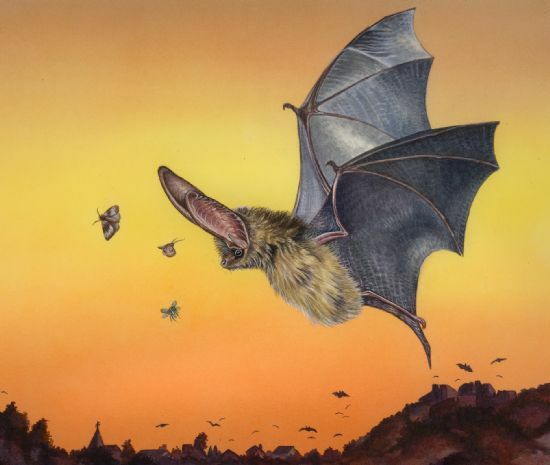 Reproduction from a watercolour, depicting this wonderful bat, which catches insects on the wing. Dimensions (including mount) - 340mm x 300mm (approx). Limited edition of 50. 10% of every sale goes to the Bat Conservation Trust. Reproduction of an original watercolour painting, depicting a Sutherland stag in all his glory. Dimensions (including mount) - 530mm x 405mm (approx). Limited edition of 50. This painting is still available as an original. Please contact the artist for more details. Pack of six different mammal greetings cards - Otter Eyes, Red Deer Resplendent, Mountain Hare Moment, Badger Boldness, Wildcat Watchfulness, Fox Fascination. Handmade embossed aperture cards (Textura Recycled Ivory)) - 104 x 152mm. Only £9.00 plus £2.50 p&p. 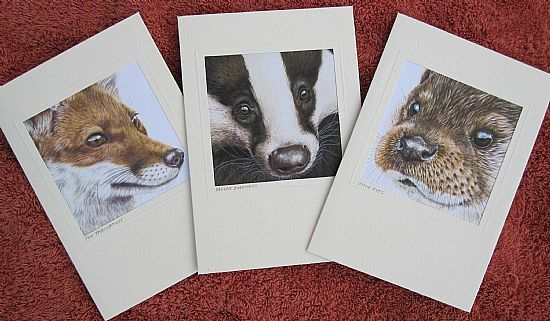 Pack of three different mammal greetings cards - Handmade embossed aperture cards (Textura Recycled Ivory)) - 104 x 152mm. Only £5.00 plus £2.00 p&p. Please contact me if you would prefer a different selection.